Spectrapil cream is useful in contact dermatitis,eczematous dermatitis & seborrheic dermatitis, Pyoderma Cryptococcosis, Candidiasis, Mixed dermal infections exhibiting inflammation and pruritus, Steroid responsive dermatoses, Idiopathic wounds and abscess. Spectrapil cream is useful in contact dermatitis,eczematous dermatitis & seborrheic dermatitis, Pyoderma Cryptococcosis, Candidiasis, Mixed dermal infections exhibiting inflammation and pruritus, Steroid responsive dermatoses, Idiopathic wounds and abscess. Its four active ingredients provide therapeutic effects like anipruritic, antifungal, anti-inflammatory & anti-bacterial. Provides prolonged symtomatic relief on topical administration. Dosage & Administration:Twice to thrice daily application has to be external. 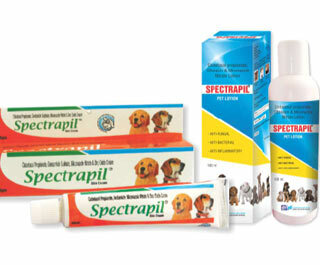 Spectrapil Lotion is for Eczematous Dermatitis Complicated by fungal & bacterial infection and wound. Clean the effected area & apply liberally 2-3 times daily.